With so many pools to choose from there's always a place to swim and relax. Cruise down the lazy river with views of the lake in the background. The little ones will love splashing around in the interactive fountains. Go head to head with friends and family on the mini golf course. Spacious kitchens really give you room to enjoy both large family meals and quick snacks. There's so much for kids to do from water parks, games, activities, and events. Cruise down one of two lazy rivers that overlook the lake. Your kids will love the two waterslides by the pool. Every suite has a primo bathtub – sit back and relax while the massage jets work their magic. Wyndham Bonnet Creek Resort is conveniently located inside the gates of Disney World®! It’s an action-packed vacation palace that surrounds a gorgeous lake in the middle. There are five outdoor swimming pools – including a zero-entry shipwreck pool with a waterslide. Go for a swim or lounge with a cocktail from one of the three poolside bars and read the latest issue of People Magazine. But wait, there’s more! There are two lazy rivers, dozens of water features, mini golf, playgrounds, movie theaters, and tons of other family-friendly amenities. If you’re itching for some alone time, you can sign the kids up for the “Play Days” activities program, which includes games, contests, crafts, and themed events. For a bite to eat, you have four restaurants ranging from pizzerias to tropical grills. Get your caffeine fix at the on-site coffee shop; it serves Starbucks! For a little exercise on vacation, head to the fitness center, stocked with top of the line equipment. One- to four-bedroom condos sleep four to twelve guests. Full kitchens have everything that you need to whip up anything from sandwiches to multi-course meals. Bring the kids along to Publix to make sure that no one’s favorites are forgotten. Don’t feel like cooking? No problem! The resort offers pizza delivery. Flatscreen TVs with DVD players are perfect for family movie night. Bring favorite movies from home, pop some popcorn and call everyone into the living room. First kid on the couch gets to choose the movie. In-Suite Washer/Dryers allow you to save space in your suitcase (more room for souvenirs!) Throw in a quick load while the movie is playing – that’s called multi-tasking. Soothe your sore muscles after a long day at the theme parks with a soak in the jetted tub. 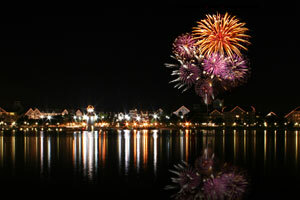 Wyndham Bonnet Creek Resort offers shuttle service to the Walt Disney World® theme parks. Classic attractions such as Dumbo the Flying Elephant®, Haunted Mansion® and Pirates of the Caribbean® can be found at Magic Kingdom®. Explore the food and culture of eleven countries at Epcot’s® World Showcase®. Ellen’s Energy Adventure®, Soarin’® and Frozen Ever® After can also be found at Epcot®. See Beauty and the Beast Live On Stage, Fantasmic! and Muppet*Vision 3D at Hollywood Studios®. Experience Pandora – The World of Avatar® at Animal Kingdom®. Start filling that extra space in your suitcase at Disney Springs. World of Disney® is the largest Disney character store in the world and features toys, stuffed animals, apparel and even Mickey Ears! Enjoy an animal show or experience at SeaWorld. Go for a ride on Mako, Orlando’s tallest, fastest and longest roller coaster. Universal Orlando® consists of two theme parks: Universal Studios® and Universal’s Islands of Adventure® that are perfect for movie lovers. Go for a ride on the Hogwarts Express at The Wizarding World of Harry Potter® or come face to face with prehistoric creatures on the Jurassic Park River Adventure. Immerse yourself in the magic of Disney and stay inside the park. Tip: Disney Magical Express buses will take you to/from the airport. Distance: 17 miles to airport.